VADP Awards Luncheon A Rousing Success! Home / VADP Awards Luncheon A Rousing Success! Over 70 VADP supporters came from all corners of the Commonwealth for the VADP Awards Luncheon Saturday, October 10th in Richmond. Former Republican Attorney General Mark Earley gave a deeply personal account of his journey from overseeing 36 executions to becoming a death penalty abolitionist. He shared key moments that deeply impacted him and led to his turnabout on capital punishment. VADP then unveiled its new Betty Gallagher Citizen Advocate of the Year Award. Tom Gallahger, the husband of the late VADP supporter and Charlottesville activist, was present to accept an award honoring her service. Their son, Tom Gallagher Jr., traveled from San Diego to be present and honor his late mother. 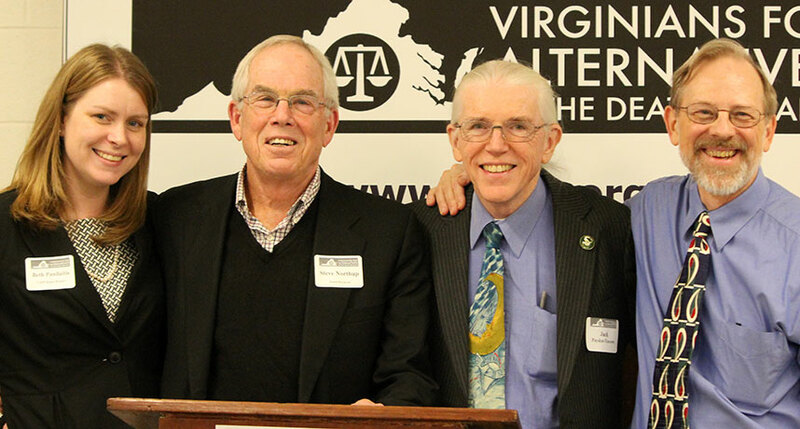 Former VADP board chair Matthew Engle and exoneree Beverly Monroe awarded the first Advocate of the Year award to Steve Northup, a long-time VADP board member and former volunteer Executive Director. Lastly, VADP gave its first Legislator of the Year Award to Del. Scott Surovell of Mount Vernon for his leadership in defeating the execution drug secrecy bill in the 2015 session of the Virginia General Assembly. To see photos from this event, click here. You do not need to have a Facebook account to view the images.